← Shut me up, fellas. This has been one of those old-fashioned New York City winters, the bleeding kind that Paul Simon wrote about in “The Boxer,” which seem to have departed with the 1970s. Those were winters before el Niño and la Niña, when weather forecasters and climatologists didn’t pay much attention to them or seem to know about the periodic warming and cooling of the vast Pacific; when word was we were heading into another Ice Age just in time for the next Arab Oil Embargo and new heating-oil rationing. 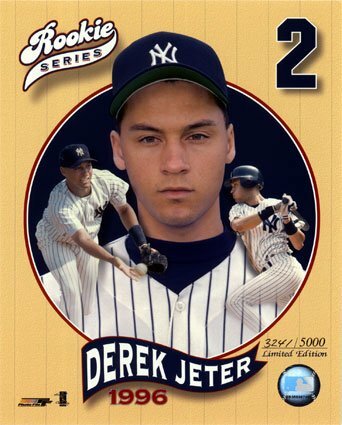 Into this world, Derek Jeter was born. In Right Off the Bat, co-writer Martin and I talk about his very first baseball game in 1996, when the coltish Jeter—amid Yankee long-beards Big Daddy (not from Cat on a Hot Tin Roof), Wade Boggs, Tim Raines, Jimmy Key, and David Cone—was the spark plug that ignited the team, ultimately to their first World Series title since 1978. Nineteen-ninety-six could not have been a more improbable season. In 1995, Jeter had a late cup of coffee with the team he would eventually captain. That season was “capped” by one of the most discouraging postseason losses by any club, ever, to the Seattle Mariners. The Mariners were the team poised to take over the 1990s and the millennium: Junior Griffey. Randy Johnson. Jay Buhner (a former Yankee!). Tino Martinez. Edgar Martinez. Oy. Oh yes, almost forgot: there was another young powerhouse shortstop with the M’s named Alex Rodriguez. Immortal time moves on. Alex Rodriguez, rival on field and in print, is now Derek Jeter’s teammate, and has been for a while. Both have morphed into the grizzled veterans they had shoved aside and out of jobs (Luis Sojo and Tony Fernandez, respectively) in their salad days. Jeter is at a particularly interesting crossroads. He was involved in a messy (for the most part not his doing) public contract dispute that helped fuel the hot-stove league, now ending with winter (we hope) and the opening (we know) of the Citrus and Cactus Leagues. DJ’s November wedding never happened. He had a mediocre season that was only magnified in the Yankees ’10 postseason loss to the Texas Rangers. At times, you could almost hear him wheezing on the field, diving for balls he would have caught before, with only a face full of dirt and stains on the uniform to show for his efforts. Jeter always plays hard, just not as well or up to his standard. It had been a long, hot, and difficult summer. George Steinbrenner, Jeter Fan, the Ultimate Not Often Happy Warrior, didn’t make it thro the summer. He died the July day Martin and I worked out our book contract (on perhaps the only wet one of the season) with Paul Dry. Sons of George, Hal and Hank Steinbrenner, have taken over the Bronx Bombers, possibly the most valuable sports organization in the world. No more George—who spearheaded a group that bought the team the year before DJ was born in those frozen, low-octane-gasoline-shortage 1970s. Hank’s first words in spring training 2011? More or less verbatim: “I saw players that are no longer hungry but were busy building mansions last season.” Jeter had erected a Florida house of thirty-thousand square feet and counting. The season about to dawn ought to be as unpredictable as ever, with, to mix a metaphor or two, a constellation of new stars eager to shine. We’ll talk more about this new season and much else in future blogs (which will be briefer—apparently, I had to get way too much off my chest today). We’d love to know what you think. This entry was posted in Baseball, Right Off the Bat Book, Yankees and tagged Alex Rodriguez, Cecil "Big Daddy" Fielder, David Cone, Derek Jeter, Edgar Martinez, George Steinbrenner, Hal Steinbrenner, Hank Steinbrenner, Jay Buhner, Jimmy Key, Ken Griffey, Luis Sojo, New York Yankees, Randy Johnson, Seattle Mariners, Texas Rangers, Tim Raines, Tino Martinez, Tony Fernandez, Wade Boggs. Bookmark the permalink.